How Will the Dickey Hiring Mesh With OSU’s New OC? Looking at the similarities in style between Charlie Dickey and Sean Gleeson. The news broke on Saturday that Oklahoma State had (quickly) found it’s new offensive line coach in Charlie Dickey. 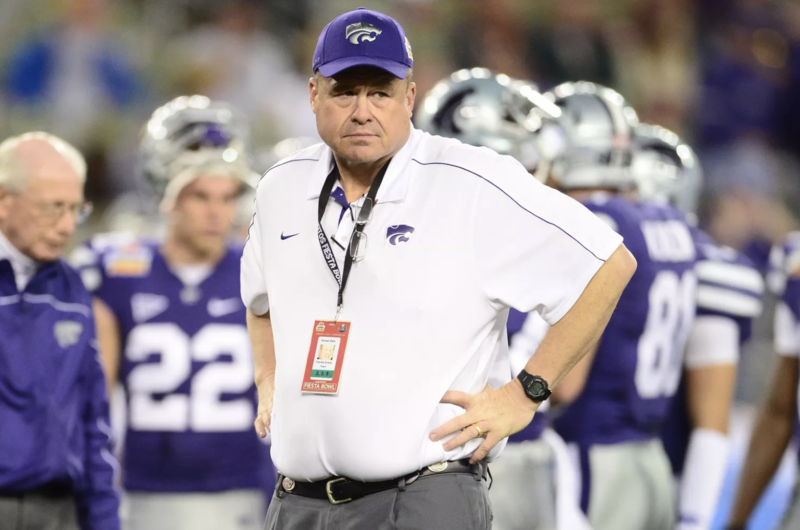 Dickey joins the OSU coaching staff after spending the last 10 seasons as Kansas State’s offensive line coach, along with holding the title of run game coordinator in both 2016 and 2017 and co-offensive coordinator this past season. The loss of Cowboy alum Josh Henson is a big one, as he was a good coach and dominated on the recruiting trail, but I think OSU fans have something to look forward to in the hiring of Dickey. I wanted to take a look at how the style of offensive line play Dickey coached at K-State translates to the scheme newly hired offensive coordinator Sean Gleeson ran at Princeton. Now, I’m not saying Henson wouldn’t have been able to coach Gleeson’s blocking schemes, but I do believe that Dickey has a lot of familiarity with Gleeson’s style and it should pay off for the Cowboy O-line. In the Buck Sweep, the back-side and play-side guard will both pull around the outside to attack the edge of the defense and create a running lane. Below is a clip of Princeton running this play last season against Columbia. Yurcich utilized pulling guards in Power runs and GT (guard-tackle) counters, but we didn’t see a lot of play-side pulling. However, play-side pulling is something Dickey is very familiar with from his time with the Wildcats, as shown in the clip below from last season’s game against Baylor. The difference between the two clips is the back-side tackle pulls here instead of the back-side guard. Dickey and Gleeson are both also very familiar with the QB sweep game. Princeton’s offense used a lot of pin and pull blocking schemes, meaning that if there is a defender lined up directly in front of an offensive lineman that lineman will “pin”, and if not, that lineman would pull. This creates additional gaps that the defense isn’t always prepared for, see an example in the clip below. Next, Taylor Kolste of Riley-Kolste Football points out how K-State uses this scheme in their running game, see the video below. Unlike the buck sweep mentioned above, the Power blocking scheme is something we have seen from recent Yurcich-led Cowboy offenses. This play usually involves a lineman pulling around to the play side to lead block through the hole. Below you’ll see Princeton run Power with the back-side guard pulling and the H-back performing a kick out to create a hole for the running back. Here you see the Wildcats running a Power for their quarterback against UCLA. Gleeson also has the QB Power in his playbook as you see on the Power run-pass option (RPO) shown in the following video. Outside of the man-blocking schemes, Dickey and Gleeson like to incorporate zone blocking as well. These type of running plays call for the running back to utilize vision and patience to find the lane opened up by the zone blocking linemen. Below you see the zone run from Princeton which results in the touchdown. Then a similar play from K-State against Texas Tech. Gleeson uses many different variations of pulling linemen when running counter. In the clip below, you see the H-back and guard as the pulling blockers. In the Power blocking scheme shown at the beginning of this post, the guard pulled and led through the hole while the H-back performed the kick out, in this counter run, the difference is the H-back is leading through the hole and the guard kicks out on the end. Dickey ran his share of counter at K-State as well, as you see on the GT counter run against OSU in the following clip. Along with similarities, Dickey and Gleeson also have some differences in their blocking schemes. For instance, Dickey likes to run “Dart“, which I didn’t see as much of from the Princeton offense, which has the back-side tackle pulling and leading the way for the running back or quarterback, as you see below. However, these differences aren’t necessarily a bad thing, as Dickey and Gleeson can learn from each other and build on their schemes to benefit the Cowboy offense. As I stated above, losing Henson isn’t something that should be swept under the rug, but I’m really excited to see what the pair of Dickey and Gleeson and can with this OSU rushing attack.